With summer upon us, you may have thought about hitting the links, or maybe you have a Tenderheart that is interested in learning the game. 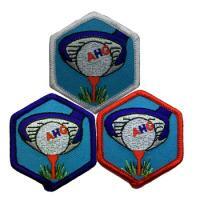 The Golf merit badge is a great way to introduce her to the game. Requirement #1, introduces the girls to the basic rules that all golfers should follow. There are 10 Golden Rules of Golfing according to Links Golf Magazine. Don’t move, bend, or break anything. Man-made objects may be moved. When you hit your ball out of bounds or can’t find it after 5 minutes of searching, add a penalty stroke, go back and drop a ball at the place where you played the shot. When you have an unplayable ball, you may drop a ball at the place where you played the previous shot, adding a penalty stroke. You may repair ball marks and old hole plugs on the putting green that are on the line of your putt, but not spike marks. This entry was posted in American Heritage Girls and tagged AHG, golf, merit badge, Outdoor Skills Frontier, sports. Bookmark the permalink.